When is the next BTO conference? The next BTO conference will take place some time in 2020, likely in March. Check back here soon for the exact date. The 2019 conference (which sold out!) was held on Saturday, March 9, 2019. Check-in typically starts at 7:30 a.m. and the last session concludes at 5:30 p.m.
Where is the BTO conference held? Chesapeake College in Wye Mills, Maryland, at the intersection of U.S. Route 50 and Maryland Route 213. The address is 1000 College Circle Wye Mills, MD 21678. Visit our MAP page for an interactive map and driving directions. Where on the campus does the conference take place? The Kent Humanities Building, at the back of the campus of Chesapeake College, on the side farthest from U.S. Route 50. How do I find the sessions/workshops in the Kent Humanities Building? A full-page map and schedule of speakers’ presentations will be in the printed program you will receive in your conference folder at check-in on the morning of the conference. When does registration open, and how can I find the form? Online registration started October 1, 2018 for the 2019 BTO conference. See our Registration page for more information. On the day of the conference, check-in in the Kent Humanities Building on the back side of the campus. REGISTER HERE NOW. Yes. For the 2019 conference, attendees were required to register online by Feb. 28, 2019. There is no walk-in registration on site at the conference. The BTO conference typically sells out in advance of the deadline, so we urge you to register early. Early bird ticket: $95 (for ESWA members; $130 for non-members) through Nov. 30, 2018. Non-members who register will receive a one-year membership as part of their registration. Student ticket: $55 (for students with valid ID, which must be presented at checkin on the morning of the conference.) Only 25 of these tickets will be sold, so don't delay if you are considering registering. What is the definition of “student” with regard to the registration fee? A student is someone who is registered and taking classes at a qualified educational institution. To qualify for student registration, you must bring your student ID card and show it when you sign in on site the morning of the conference. How can I pay for the conference? When you register online, you'll be given a choice of "SEND INVOICE or "PAY ONLINE." If you request an invoice, you'll receive a bill in the mail and must send it back to ESWA with a check in the full amount to save your seat. If you click "pay online," you will be switched over to PayPal and can pay for your ticket via PayPal. No, the registration fee for this nonprofit conference is already modest, so group discounts are not feasible at this time. Could the conference be canceled because of bad weather? Yes, although that hasn’t happened in nineteen years. 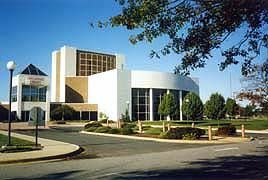 For inclement weather information the morning of the conference, call Chesapeake College at 410-822-5400 and listen to the recorded message. Or check this website for information about cancellation due to bad weather. We will post a notice on the home page regarding any weather-related issues. Will there be refunds if the conference is canceled due to bad weather? If the conference is canceled due to adverse weather conditions, you will be reimbursed your registration less handling and food fees for which the conference is responsible. Payment will be made within 60 days of cancellation, via a credit on your credit card. It includes your choice of six from among 30 different presentations offered, along with continental breakfast, networking buffet lunch, snacks, beverages, and access to the on-site conference bookstore featuring speakers’ books. All attendees will receive a printed program of the day’s schedule when they check in. If you are not an ESWA member, your registration fee will include membership in ESWA for one year. What is the program lineup, and how does it work? In addition to the keynote, you may attend up to six sessions offered throughout the day. Five options are offered concurrently in each of six time slots, with short breaks between. Simply walk into the classroom hosting the speaker of your choice and you’ll be able to attend that session, unless the room capacity has already been reached. There are enough topics and sessions, though, that everyone should be able to attend most of their first choices. The program runs from 8:00 a.m. until 5:15 p.m.
Do I need to sign up in advance for the sessions I want to attend? No, but some sessions may have a full audience, in which case you can go to any of the other sessions offered during that time period. The online registration form has a checklist where you can indicate which sessions interest you most, which will help the organizers assign the most popular speakers and topics to the largest classrooms available. Providing this requested information does not mean that you are assured a seat in that session. There are no reserved seats. How can I reserve a seat for a particular session? You can’t. Seats for sessions cannot be reserved and are on a first-come, first-served basis. No one will be permitted to “save” seats for other attendees. The conference must adhere to the maximum capacity posted in each classroom as determined by the local fire marshal. When a classroom is filled to capacity, “Session Closed” signs will be put on the closed door. There can be no exceptions. What other learning/fun opportunities are available at this conference ? This year we kick off the conference with a keynote address from Greg Wilhelm. Throughout the day our Bookstore will be open. At lunch, take advantage of network tables to chat and learn from others in your particular genre or interest. Will handouts be provided at all sessions? Some but not all speakers provide handouts. While we encourage our presenters to bring material of their choice, there are costs involved as well as intellectual property and copyright concerns. We cannot mandate this. You are encouraged to bring sufficient paper/pen to take notes and contact the individual panelists for further information. Can I use my laptop or iPad at the conference? Yes, the buildings and all the conference sessions have free WiFi available. Menus for the continental breakfast and networking buffet lunch do provide a variety of options. We regret that we are unable to provide food to meet individual needs. If you have any concerns, it is strongly suggested that you provide your own food. Are pets allowed to accompany attendees? No animals except service animals are permitted. No. Children will not be permitted. Do I get course credit for attending BTO? No, no course credit is given for the conference. Can I sell my books at the BTO bookstore? This option is only available to presenters. Contact the coordinating committee for more information: easternshorewriters@gmail.com. How do I become a speaker at a future Bay to Ocean Writers Conference or volunteer to help with the conference? 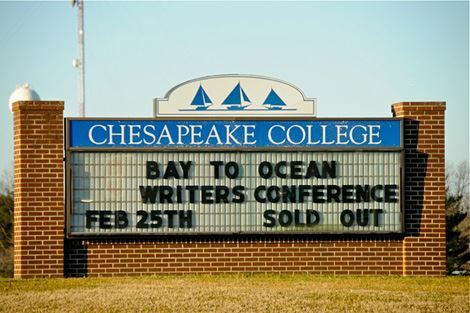 We encourage you to contact the conference committee via email: easternshorewriters@gmail.com. 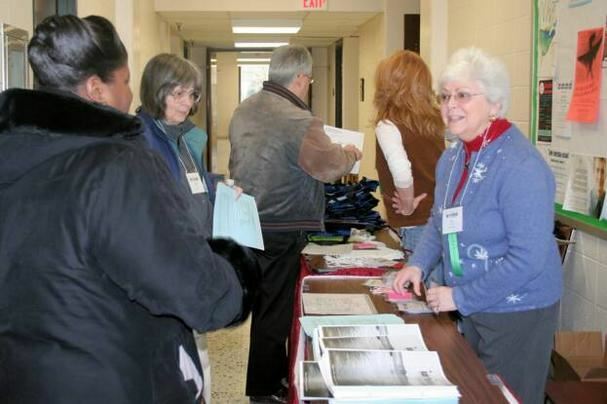 How do I join the Eastern Shore Writers Association, which sponsors the Conference? All registrants for BTO who are not already members receive an ESWA membership as part of their ticket price. When you purchase a non-member ticket, your name will automatically be added to the ESWA membership list. You will receive an email from ESWA at the email address used to sign up which will include a temporary password for the ESWA website. I have other questions. How can I contact the organizers? We regularly check our email at easternshorewriters@gmail.com. You may also contact the organizer or one of the committee members directly.